Whereas the diameter of an industrial sized valve and attached piping could be as large as several feet, as the swing check valve can be, many miniature check valves boast diameters as small as a quarter inch. Some miniature check valves weigh as little as 0.7 grams, though these are for extremely precise operations such as chemical or medical dispensing. However, the capabilities are still very impressive. The maximum operating pressure can be as high as 5,000 PSI, a value that exceeds many larger instruments. Miniature valves can also have a cracking point as low as 0.005 PSI, which means that the valve can be opened for operation even at extremely low pressures to accommodate lesser process streams. These miniature check valves, with both high and low pressure ratings, are extremely compact and easily installed in small piping. Non return valves of this nature accommodate the controlled transfer of fluid or gas in applications such as vacuums, ventilation systems, refrigeration, heating, cryogenics, medical, water treatment, metering, dental and mixing among others. These industries rely on miniature check valves to protect product and equipment from harmful backflows, the repercussions of which can be costly and dangerous. Miniature check valves are well suited to low resistance, high flow applications where they easily prevent pressure surges, cross-contamination and flooding. To reap these benefits it is important to install the valve properly with the correct orientation. Many check valve manufacturers etch or stamp directional indicators on the outer surface of the main body in order to prevent potentially damaging improper installation. Although there are numerous types of miniature check valves widely available from retailers and manufacturers around the globe, the overall process is similar for each. The body of the valve is a cylindrical or spherical cavity that is inserted in the pipeline. A seat, or cross-sectional element with a central hole, is placed perpendicular to the pipeline in order to create a division between the upstream and downstream sides of the piping. An oversized stopper rests in the seat. This may be a ball, disc, piston or other apparatus. When fluid or gas flows at the optimal pressure, this stopper is lifted from the seat, creating a gap through which materials may flow. When the forward moving pressure drops and the downstream pressure increases, the stopper is quickly pushed back into place, creating a tight seal that prevents reverse flow. While metal valves made of materials such as stainless steel, aluminum and brass are popular, they may be more prone to leaking than plastic check valves, which offer slight deformation under pressure and therefore create a better seal. 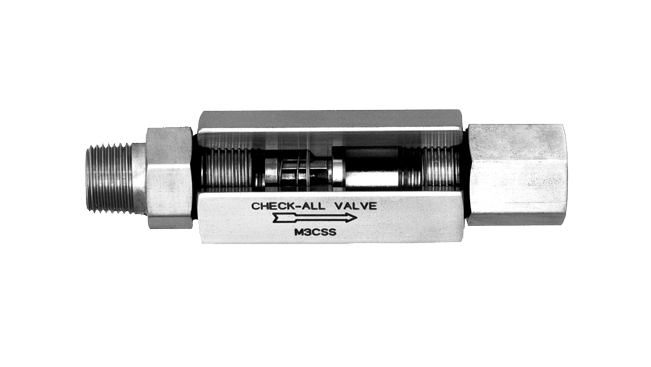 Other considerations for miniature check valves include maximum operating pressure and temperature, flow rates and overall dimensions which may vary considerable. 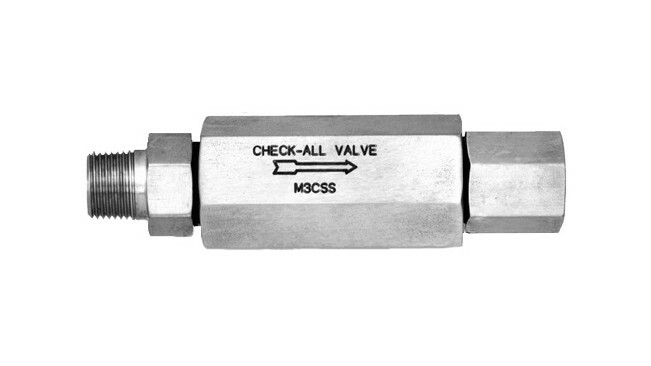 It is important to consider these options and others with regards to intended use when selecting a miniature check valve. Miniature Check Valves Miniature check valves are designed for precision fluid and gas flow regulation in small applications where unidirectional flow is needed. These micro valves operate with the same components as larger check valves but with each element scaled down considerably.